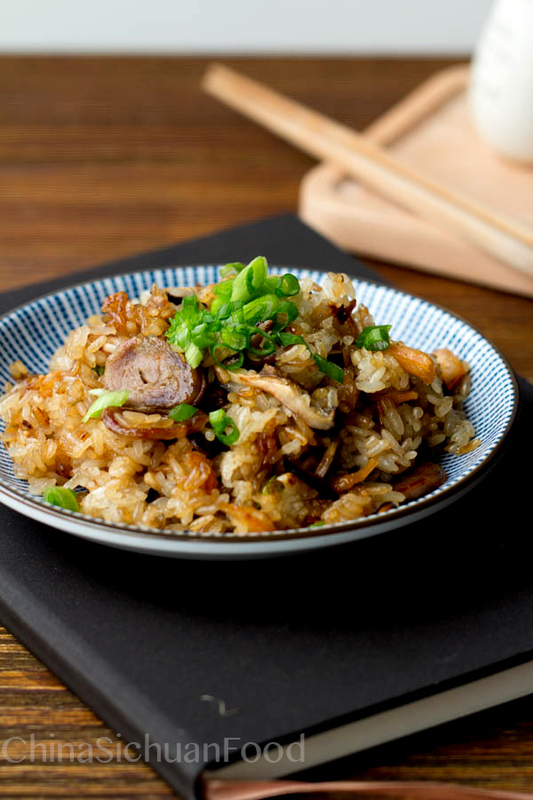 Savory Chinese sticky rice recipe with Chinese sausages, dried mushrooms and dried small shrimps. 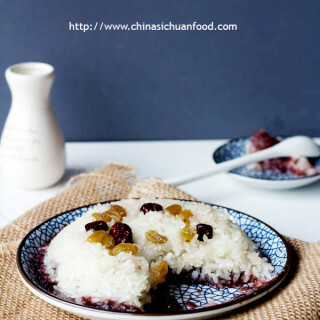 And sweet Chinese sticky rice recipe with red bean paste. We have made this savory version for the past Chinese New Year. My father in law bough us a large bag of Hunan style sausage. So great! 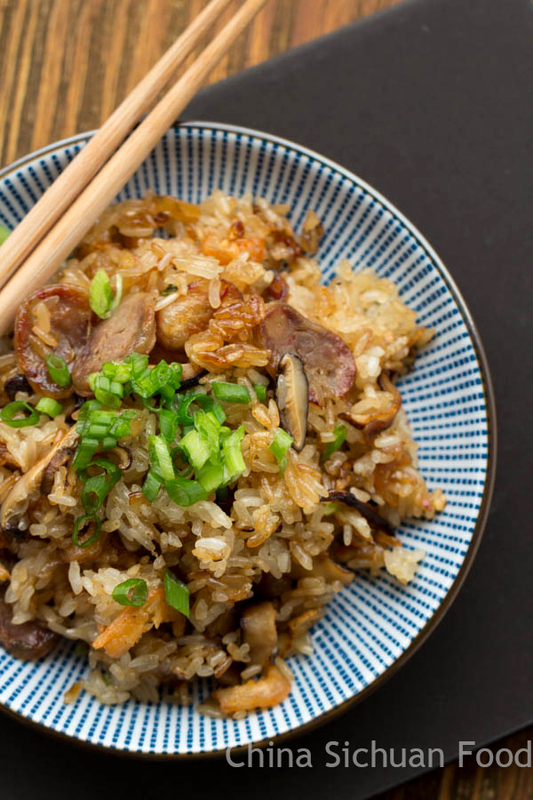 I love Chinese sausages so much especially with rice, no matter normal rice or this special sticky rice. 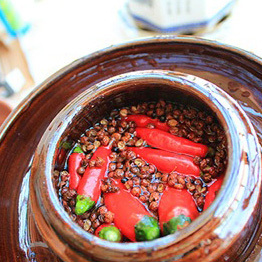 Sticky rice is also referred as glutinous rice, is a kind of ingredient use in many Chinese holiday recipes. 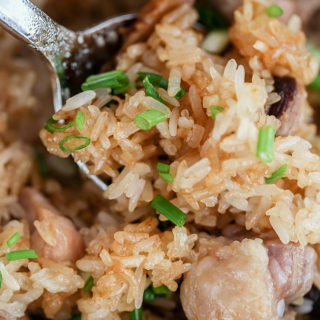 Sticky rice is gluten-free and treasured by our ancestors for hundreds of years. 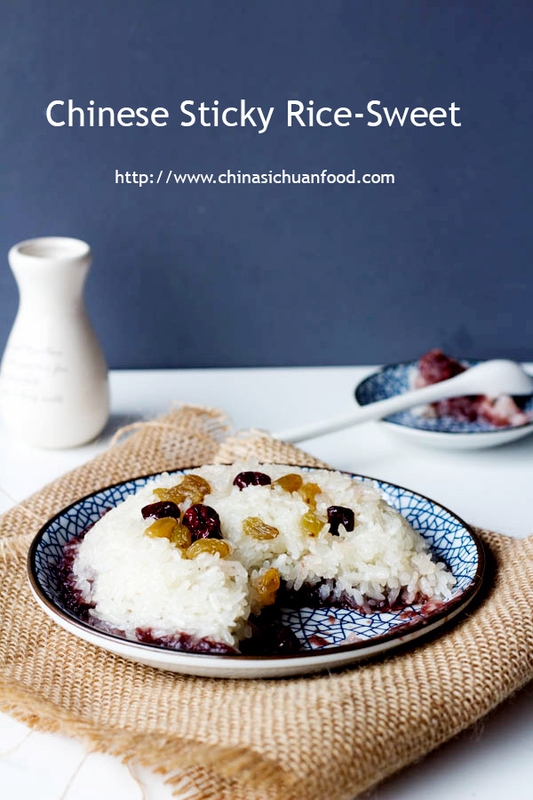 There are mainly two types of flavor in China concerning about directly cooked sticky rice, one is savory and the other one is sweet usually with sweet red bean paste. 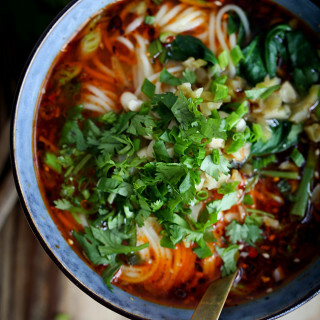 Elaine will introduce the two versions together in the following recipe. 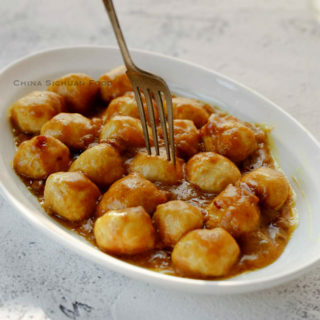 Besides, we have many recipes use water-milled sticky rice like Tang Yuan with black sesame filling, coconut sticky rice ball, Fried sesame balls etc. Glutinous rice flour is just used to easy the process since we do not have stone mill in modern kitchens. 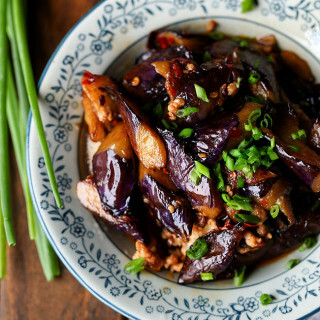 If you do not have Chinese sausage on hand, replace with chicken. 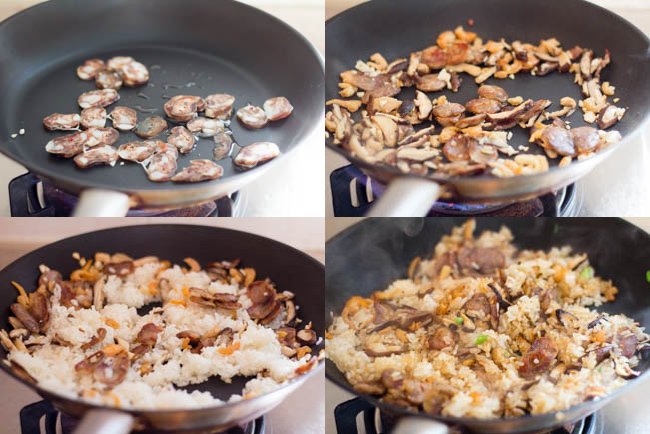 For the dried mushrooms, soak the twice and keep the second soaking liquid for the stir-frying process. The soaking liquid carries strong aroma of dried mushroom. After the first soaking, wash the dried mushrooms carefully to remove any sands contained. Sticky rice usually needs some fat. Traditionally, we use lard. If you do not have it, try to make some according to this home rendered lard. It is not that bad as told. Or you can replace with other oil you prefer. Besides, we used to make eight-treasure sticky rice with red bean paste. You can definitely choose any dried fruits or your favorite nuts. It is important to pre-soak the rice before cooking. Usually 4 hours are highly recommended. If in any situation, you need to shorten the time, soak the rice with warm water. 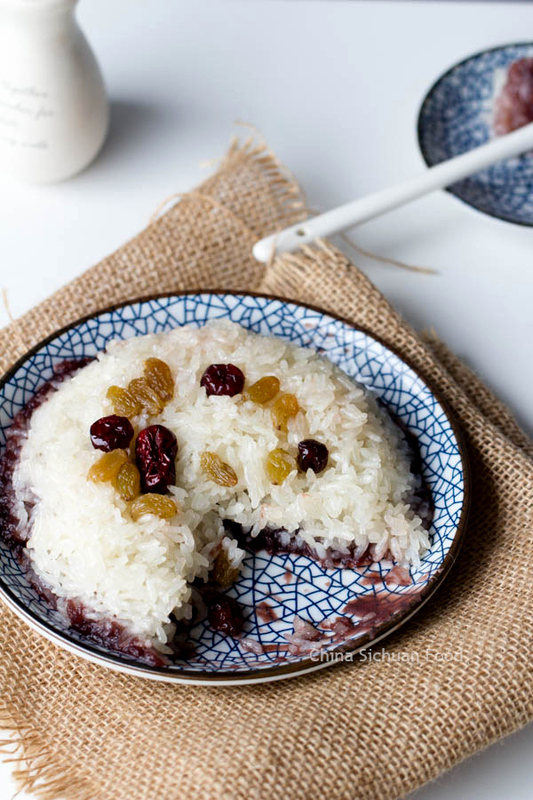 Chinese sticky rice recipes--both savory and sweet version introduced. Soak the sticky rice in clean water for around 4 hours. Drain and set aside. 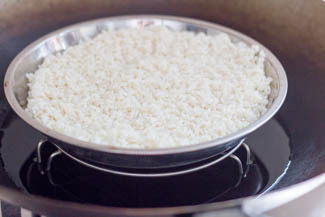 Spread the rice on a wide plate..Set up the steamer and steam the sticky rice around 20 minutes until half cooked. Prepare the steamed sticky rice and add 1/2 tablespoon of cooking oil and mix well so that they will not be sticky to each other. Wash the mushrooms carefully and firstly soak them with hot water for around 10 minutes. Wash again to remove sands and soak again with half cup of clean water. Reserve the soaking liquid for the following stir- fry process. Strain the liquid and set aside. Soak the dried shrimp too. And then cut shrimp and mushrooms either into small dices or slices. 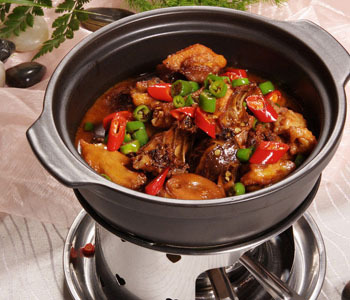 Set up the steamer; spread the rice on a wide plate and steam the sticky rice around 20 minutes until half cooked. Transfer out to a large bowl. 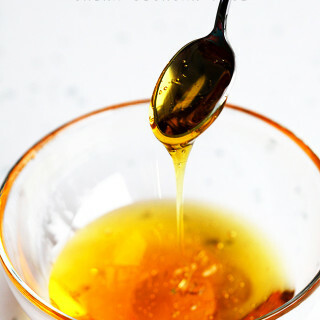 Add 1/2 tablespoon of cooking oil and mix well so that they will not be sticky to each other. Heat up the wok with around 1/2 tablespoon cooking oil and then fry the sausage until there is some oil released. Add garlic, mushrooms and dried shrimp. Fry for around minute; place sticky rice in. Slowly add the water for soaking mushrooms by batches, around 1 tablespoon each time until the sticky rice is well cooked. Pour in soy sauce, oyster sauce and sesame oil. Mix well. Taste to see whether pinch of salt is needed. Add half of the green onion and mix well. Garnish the left before serving. Prepare the steamed rice and add sugar and lard. Mix well when the rice is still hot. Prepare a regular rice bowl around 10 cm diameter. Brush some vegetable oil on bottom and lay the decorations. You can use some favorite nuts too. 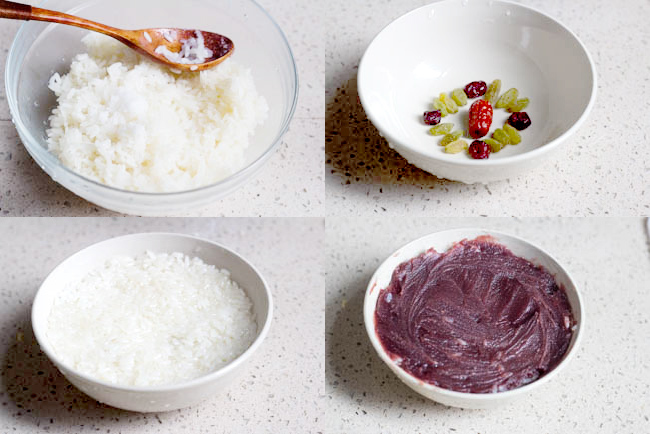 Transfer the sticky rice to the rice bowl and slightly press them. Add red bean paste and flat with a scoop. Continue steaming for around 20 minutes to 30 minute. Cover the bowl with a plate. Turn the bowl over to transfer the content to the serving plate. Yum! This is such a great recipe. 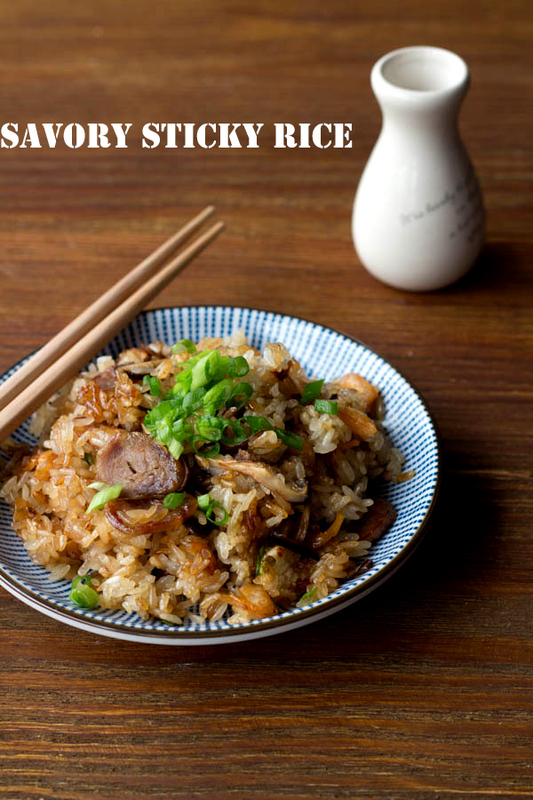 I so would love to have a nice big bowl of the savory sticky rice. Pinning. You are so kind. Happy cooking ahead! Thank you for the recipes! 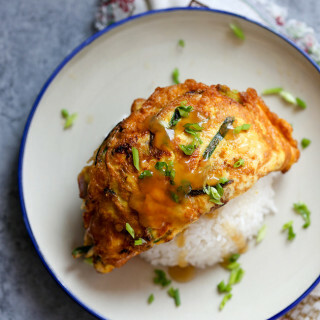 My husband tried the savory version of your Sticky Rice recipe and the dish is so good! Very delicious and easy to make! You are a great cook! We live in the US and eating this dish brings back a lot of good memories from my hometown, Singapore. Xie Xie! I tried the recipe with German sausages (Mettwurst) because it’s hard to find Chinese sausages in Germany. But the result was perfect! It is perfectly ok to use other sausages like German sausages and Spain sausages to replace Chinese sausage. I believe that’s a comfort dish. Thanks for leaving me such a warm comment. sticky rice is delicious, love the consistency! I made the sweet version, but slightly different, with a bit of coconut milk in the rice like the thai version on your page; red bean paste and lingonberry compote. Those two fit so well together ! I will try savory version soon, but as I don’t know where to get chinese sausage, I will just replace with sausage from my country. Can you maybe describe me how the sausage that you use tastes? Is it sausage with lots of different spices, so that the meat taste is more in the background, or a very meaty sausage? Are they hot (lots of chili or something like that)? Slightly sweet or sour? Which meat are they made of? I want to buy the most similar taste possible. 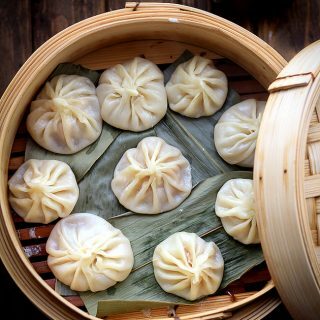 In fact, the savory version is more popular in China. Though I have not tried to use other sausages in this recipe, I believe you can have a try. I get feedback from other reader who use Italian sausages. Chinese sausage is made from pork, some with spices like Sichuan version and some are sweet. They both perform well. Possibly, I will draft a post introducing Chinese sausages in details when my mother make her batch this winter. Is there a Chinese name for both of these dishes? I can’t seem to find what this is called. This dish looks awesome. Can’t wait to try it. Thanks!